The trial of a prodigal child is a uniquely painful one for a woman. As we live in a day in which the enemy is coming after our children in an unprecedented way, we will increasingly find ourselves ministering to a mother whose child has turned their back on the Lord or is mired in darkness. 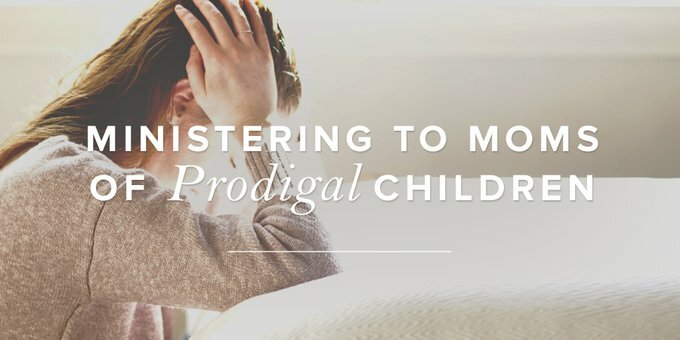 A woman with a prodigal child often reels with guilt and shame as she feels she has somehow failed her child, no matter how faithfully she raised him. The unspoken (though sometimes spoken) undercurrent of “it is your fault” often comes through the well-meaning advice of others. It flashes in technicolor as a mother looks from her struggling child to others who seem so perfect. While some brokenness seems acceptable in society or in the church, she may feel her situation is unacceptable. Because of this, she is often unwilling to share her situation or her prayer needs, resulting in isolation and vulnerability. She is confused by what is happening, her prayers feel unanswered, and she is afraid. She is desperately weary from the war that is raging in her home and feels helpless to stop what is happening to her family. (A prodigal greatly impacts the other children and the marriage.) In a very real sense, she is grieving. Dreams for her child may have been lost, a future altered, and the “happy family” she had long hoped and prayed for may have been radically changed. She is faced with a reality that she never believed would be hers. How can we most effectively and lovingly hold up her arms in this battle? First of all, be an available, safe place where she can be heard without shock and without judgment. She needs to be loved, affirmed, and prayed with and for in a grace-filled place where she is unafraid to be real. Sometimes she just needs someone to quietly hold her and cry with her. Be aware that there may be a real need for a professional counselor’s intervention. Ask the Lord for wisdom in directing her in that way even as you walk beside her. As with every trial, her greatest need is to be consistently reminded of the unchanging character of God (Heb. 13:8) and of His sure and unfailing promises. The Lord is asking her to trust Him with what is most precious to her in a place that can feel so very dark and out of control. She needs reminding that He remains sovereign and wise regardless of the choices her child is making. When the “Why?” questions pound her, she needs assurance that God’s ways, though so different from ours, are grounded in infinite mercy and love. When she strains to believe that the cries of her heart are being heard, take her back again and again to the truth of who He is, to His heart, and feed her with the only promises that she can count on as certain. As much as we want to say the right thing to give her courage and hope, only God’s assurances can hold her when she feels almost overwhelmed by the trial (Isa. 43:1–3) or feels too weak to go on fighting (2 Cor. 12:9). Help her continually lift her eyes off of the heartache in front of her and back onto Jesus. Though this battle is the Lord’s, He has called this precious mother to fight for her child. The key is to use the weapons He intends. In her desperation, she can easily find herself resorting to the weapons of the world that arise from our flesh . . . anger, accusations, and manipulation. These tactics are hard to resist when your own heart is being wounded and fear grips you, but they prove faulty to open this child’s eyes and turn him from darkness to light (Acts 26:18). Only God’s divine weapons—the Word of God and prayer—will pierce a hard heart, tear down strongholds, and always accomplish God’s purpose (Heb. 4:12; 2 Cor. 10:4–5; Isa. 55:11). Without question, praying God’s Word for her child, claiming it for him day after day, is the single most powerful and effective thing that she can do (James 5:16). She also needs to be reminded often that her battle is not with flesh and blood (Eph. 6:12). This war is not with her child. It is with the enemy of his or her soul. It is vital that she fight the real enemy, who would love to destroy the relationship between this precious mother and her child. Exhort her to do all that she can to keep that relationship intact, even if it is only held by the strong thread that is a mother’s love. Encourage her to forgive and love fiercely, purposefully, and unconditionally (1 Cor. 13). A mother’s love will tear down walls the enemy wants to erect and will keep the way open for healing. Her child desperately needs her presence in his life even if he loudly proclaims that he does not. Help her to keep her arms open wide for her prodigal’s return, whenever that might be (Luke 15). She will likely struggle greatly with laying down her fix and rescue instincts, which often get in the way of God’s work and purposes. Yielding control and allowing difficult consequences that tear at her heart requires confidently desiring God’s will—whatever that entails—and great faith (Prov. 3:5–6, Jer. 29:11). She must begin learning to trust His love and His plan for her child more than her own (2 Tim. 1:12). This trial is rarely a short storm, and things could very likely get worse before they get better. It is an easy place for discouragement to grow and trust to waver. Help her look for and celebrate the places that she can see God’s hand at work, however big or small. This will strengthen a mom as she waits (2 Peter 3:8–9). Believe with her and for her. It is often in the darkness that God does His greatest work (Ex. 14:21). Take her weary heart again and again to the power of the cross. There is no darkness that the light of Christ cannot pierce and no heart that is beyond His reach. No matter what she sees, she must continue to pray without ceasing, clinging to the absolute truths that God always completes what He has begun (Phil.1:6) and has the power to do all that He has promised (Rom. 4:20). Finally, encourage her to receive God’s grace for herself (Heb. 4:16). Help her to wash in His unconditional love, in the forgiveness He offers for every place that she feels failure, and in the realization that her weakness is the opening through which He can pour His strength and faithfulness. From the beginning of this journey to the end, His grace will be enough for a woman who trusts God with her prodigal child (2 Cor. 12:9). Kathy Davis has been leading women for over twenty years through the ministries of Bible Study Fellowship and Community Bible Study. In 2011, God called her to minister to those with prodigal loved ones out of her own heart-wrenching experience. Kathy started a ministry called Mother's Heart, which serves as a safe haven of encouragement and prayer support to women with prodigals. Kathy lives in Columbia, South Carolina along with her husband, Chuck, and is mother to four adult children and one daughter-in-law. Kathy finds refreshment digging in her garden and following USC Gamecocks sports. Previous Post What’s a Mentor to Do?